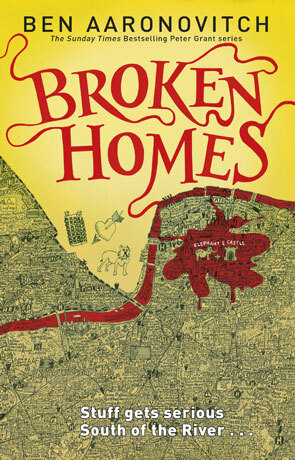 Broken Homes is the fourth novel in Aaronovitch's Rivers of London series and each one gets better and better - this one though has a completely unexpected twist at the end that I guarantee will leave you breathless and have you clambering through the book looking for the clues along the way. One of the great things about this series is how the author manages to portray the protagonists in such a convincing fashion. While I've never worked as a copper I have had the fortune to work alongside them on the odd occasion and you could be quite forgiven for thinking the author had spent the last twenty years in the force. He is that convincing and it has to be about the most realistic portrayal I have yet read of police officers. This realism doesn't stop there though and soaks into the plot itself which is convincingly twisted and convoluted with leads coming from and leading to unlikely destinations. This is a refreshing unpredictability which is heightened by the strange and mysterious River Gods and their other-worldly hi-jinks. This adds tremendously to that all important suspension of disbelief - re-enforced by the underplayed use of magic and strong laws of nature that practitioners are bound by. In Aaronovitch's reality magic is a force that has to be respected, takes a huge amount of effort to learn, is not limitless and the use of which has consequences (not least of which includes the health of the practitioner). I lived in London for a while and I can confidently say that he describes the city and it's inhabitants perfectly, absolutely spot-on. One of the things you learn living on London is that in many ways it's a metropolis built up by towns and cities that have merged into this huge monster collectively known as "London". No-one who lives there describes themselves as just being from London (unless you happen to live in the center); you are a North Londoner or a South Londoner or an East-Ender and if you are a North Londoner and travel south you really will feel out of your comfort zone. There is a wonderfully warm and comforting quality to the writing that if I had to offer comparison too would liken with Jim Butcher - who shares that same quality that appeals directly to the reader and makes them feel a distinct part of the adventure. Even though we are now four books into Rivers of London it still feels like a young, fresh series that we have only begun to explore and has a huge amount yet to offer. This is re-enforced by details such as the elusive "faceless man" - a villain who is even more elusive than Moriarty and is always seemingly one step ahead and often lurking off-screen. Ben Aaronovitch gets better with each book and Broken Homes is no exception, it's witty, friendly and fast paced with some fantastic characters, a great story and one of the most shocking, unpredictable endings I've read in some time. Written on 18th October 2013 by Ant.